Riga is a very beautiful city, as here a lot of ancient and old buildings were preserved that don’t leave anybody cold. 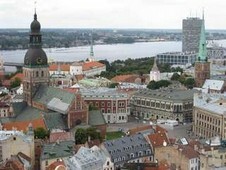 Among all Baltic capitals, it is Riga that seems to be a real megalopolis. The city is full of life, it attracts a great amount of tourists, makes them coming here again and again. Riga is a city full of green parks and small cosy cafes. The city seems to be leaped from the fairy pages. You will certainly like this city. New and old amazingly combines in Riga. Travelling in Riga you would certainly like to see as more sights as possible, do shopping, visit various museums. To have enough time for all you planned and to move around the city and country comfortably, we recommend you to use car rental services. On the bookingcar.ru website you can see affordable car rental deals and book a car you like right now. Advance booking allows you to order a car to be delivered directly to the airport of Riga. You can also order a car to be delivered to your hotel. Irrespectively of where your car is parked, don't leave anything valuable inside it. Toll parkings irrespectively of their location and zoning, can cost 0,6-8 LVL for first hour. The most expensive parking is that in the Old Town. Even paid parkings at evening and nighttime are free of charge. Parking in left-bank Riga is also free of charge. Mostly the parkings are paid via pay machine. If you didn’t pay for the parking, filling station's worker can block a car's wheel. You can contact them by phone and also must pay a fine. Note that in the Old Town area there are also some free of charge parkings. Maximum blood alcohol content allowed is 0.5 ‰. If blood alcohol content is 0.5-1.0 ‰, a fine is 300-450 LVL, and can be punished with driver's licence confiscation. Further exceeding of the blood alcohol content allowed leads to a fine in the amount of 600-1000 LVL and driver's licence confiscation up to four years. For those drivers who have less than two years of driving experience, maximum blood alcohol content allowed is 0.2 ‰. Driving regulations in Latvia have no significant differences from the Russian ones. There are some things that you have to know about not to be imposed a fine and get troubles during your vacation. For example, don't forget to fasten the seat belts, at any time of the day switch on the low beam, transport children in a car in special car safety seats only. Naturally overtaking in wrong place, passing through the red traffic light, wrong parking, not stopping at police officer's demand, going at contraflow lane, and other violations lead to punishment. Filling stations in Riga can be found very often, so you don't need to watch the fuel. One can fill a car with (RON95 and RON 98) petrol or diesel engine. There are also gas filling stations. If you are going to a long trip, you can take petrol with you. One can pay with cash or with a credit card. Some filling stations are automatic and some are working with staff. Fuel in Latvia is of high quality. Latvia from 16 eur a day.